The purpose of this chapter is to identify and critically engage with the literature on wealth and power clusters in political economies. 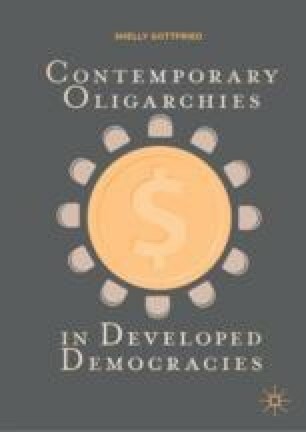 Reviewing historical and contemporary scholarships that have emerged over time when the questions about the concentration of resources, namely, money and power in the hands of a few, arose, this chapter expands the analysis of oligarchy, largely drawing on Jeffery Winters’ conceptual analysis (2011), with respect to four critical points: distinguishing oligarchs from oligarchy; assessing the origins of oligarchy and the mechanisms through which it establishes its power in a national political economy; the role of the state in the emergence and operation of an oligarchy; and the distinction between oligarchs and other wealthy players. These differences, and other points mentioned in the previous chapter would be presented in the following pages, put this book outside the scope of the individual theories and scholarship examined. Aminadav, G., Bachrach, Y., Kosenko, K., Rosenschein, J. S., & Wilf, Y. (2011). Rebuilding the Great Pyramids: A Method for Identifying Control Relations in Complex Ownership Structures. SSRN [Online]. Available: http://ssrn.com/abstract=1903941. Accessed 30 June 2018. Johnson, S. (2009). The Quiet Coup. The Atlantic, p. 52. Available: http://www.theatlantic.com/magazine/archive/2009/05/the-quiet-coup/307364/. Accessed 24 January 2018. Kosenko, K. (2013). The Nature of Organizational Hybrids: Exploring the Evolutionary Dynamics of Israeli Business Groups, 1995–2008. SSRN. Available: http://papers.ssrn.com/sol3/papers.cfm?abstract_id=2287530. Accessed 29 September 2017. Krugman, P. (2011, November 4). Oligarchy, American Style. The New York Times. Available: http://www.nytimes.com/2011/11/04/opinion/oligarchy-american-style.html. Accessed 3 November 2017. Stolz, S. M., & Wedow, M. (2010). Extraordinary Measures in Extraordinary Times: Public Measures in Support of the Financial Sector in the EU and the United States (Occasional Paper Series, No. 117). Available: http://www.ecb.europa.eu/pub/pdf/scpops/ecbocp117.pdf. Accessed 6 June 2014.